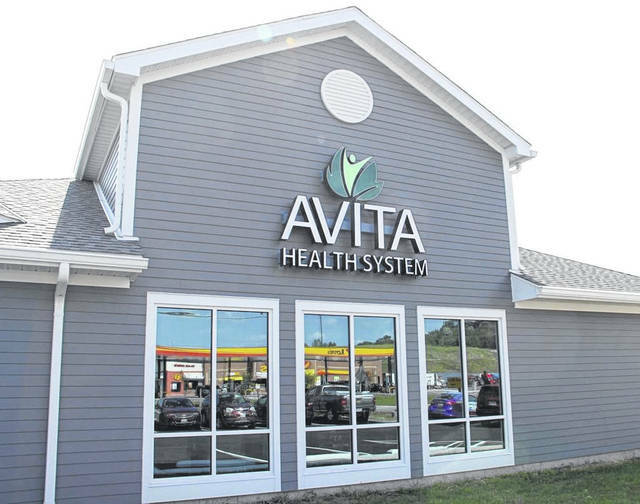 Russ Kent | Galion Inquirer Avita Health System had an open house for it’s newest facility Thursday. Avita Bellville will included a walk-in clinic daily from 8 a.m. to 8 p.m., doctor’s offices. BELLVILLE — Avita Health System celebrated the completion of its newest medical facility — Avita Bellville — with a ribbon cutting and open house Thursday evening. On Monday, at 8 a.m., the clinic will officially open its doors for patients. Located just off of 1-71 at 987 State Route 97 West, Avita-Bellville will feature a walk-in clinic for urgent care, as well as physician offices. The walk-in clinic will be open 8 a.m. to 8 p.m., seven days a week. Patients will be able to receive treatment for non-life-threatening injuries and illnesses that need addressed promptly: colds, sprains or strains, fever, rashes, cough, cuts or scrapes, minor burns, allergies and eye irritations. The physician offices will initially provide specialty care for orthopedics, sports medicine, cardiology, general surgery, and urology. Avita Bellville is a 5,775 square-foot facility that features 11 exam rooms — including 2 procedure rooms — and on-site x-ray. The facility is part of the original financing from the United States Department of Agriculture, which also funded Avita’s Ontario Hospital. Avita worked on the project with architect Dan Seckel from The Seckel Group, LTD, a Mansfield-based company, and general contractor Mike Obringer of Studer-Obringer, Inc. in New Washington. Local companies were utilized for the entirety of the project, and construction lasted approximately 10 months. For more information on Avita Bellville, call 567-560-3790.
https://www.galioninquirer.com/wp-content/uploads/sites/38/2018/08/web1_Avita-Bellville.jpgRuss Kent | Galion Inquirer Avita Health System had an open house for it’s newest facility Thursday. Avita Bellville will included a walk-in clinic daily from 8 a.m. to 8 p.m., doctor’s offices.